This Pachai Payaru Kuzhambu is usually served with hot rice. Soak green gram in water for about 5 to 6 hours or over night. Wash well and put it in a pressure cooker. Add one cup water along with a pinch of salt and cook for two to three whistles. Soak tamarind in water and squeeze out the juice and make two cups of tamarind juice by adding enough water. Chop onion, garlic and tomato into small pieces. In a kadai put the oil and when it is hot add mustard. When it pops up, add fenugreek, asafoetida and slightly fry. Then add chopped onion, garlic flakes and curry leaves. Fry for few seconds. Add tomato pieces and fry till it mashed well. Then add tamarind water along with sambar powder, turmeric powder and salt. Stir well. Allow to boil. 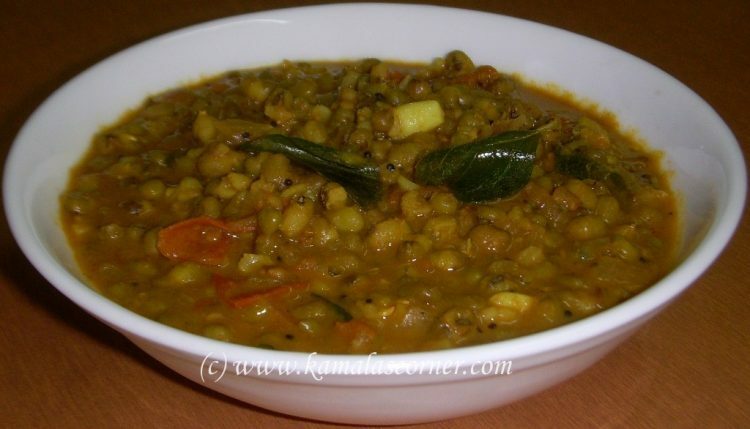 When it starts boiling add the cooked green gram slightly mashed and again allow to boil for few more minutes. பச்சை பயறு குழம்பு தேங்காய் மட்ரும் பெருஞ்சீரகம் அரைத்து விடுதல் நன்றக இருக்கும் …. உண்மை. ஆனால் பெருஞ்சீரகம் போன்ற மசாலா வாசனையை குழம்பில் விரும்பாவதவர்கள் இப்படி செய்து சாப்பிடலாம். im always checking ur site for new dishes and im trying some gravies too…tel how to prepare a mushroom rice.. I will soon post mushroom rice recipe. Thanks a ton mam. i used to dry roast thattapayiru and immediately boil it and will make kuzhambu. can i do it as the same or I have to soak it for 6 hours. Thank you Latha. We can make this kuzhambu with sprouted moong also. Pl try and let me know your feed back. Thanks mam, will try tomorow and will get back to you. Another request mam, can u pls post any vegetable sandwich recipe pls ? Thank you mam………tried this today..really very awesome and healthy recipe…….can u plz suggest if we can add some vegetables also with this?.. You can add vegetable also. However it will be slightly different in taste. Thank you Samyu for your feedback. Nice to hear that this Kuzhambu turned out well. Thank you Selvakumar Prakash for the feed back. Thank you Jayanthi for your feedback. hello mam, i am working at saudi arabia .i havent any canteen facilities. i am cooking myself. i dont know cooking also.i search lot of block about cooking. but its very difficult to cook and take long time to cook. its not well like us. but now i am cooking verywell in a simple easy methods within short period . thanks for for your post.thanks a lot. its very useful for me and like my friends. Welcome to our site. Thank you for your kind words. I tried the recepie. It came really well. I added 3 green chillies to the dish while frying onions. I pressure cooked the payaru atlast after adding onions,tomatoes mix. Thank you Vijay sharing your method. Very good. But they say Tamarind is NOT good for health. Can we use Lime to get sour taste? Can I try? Thank you for writing. We, South Indians, use tamarind in most of our dishes. Nothing to worry. However, anything in excess may cause some problems. In fact,Tamarind contains certain health benefiting essential volatile chemical compounds, minerals, vitamins and dietary fiber. If you do not like tamarind, then try with lemon juice. We can also smash slightlyt the green gram after the cooking process will be over. It will give more taste. Thank you Deepa for your suggestion. No need to soak payaru overnight.dry roast till aroma appears and cook.It enhances taste also.My grandma use to prepare payaru thoran and curry using coconut by roasting. Thank you Usha for sharing your method. I will add this method also in the post.